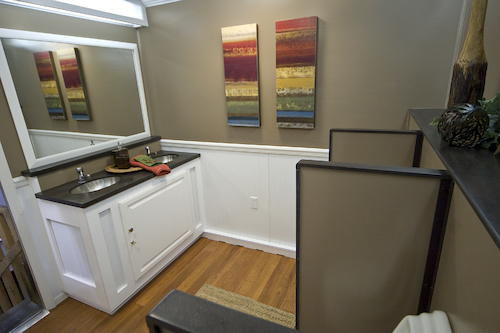 The Elegance Series 10 station restroom trailer brings the feel of an upscale, in-home bathroom to your outdoor event. The interior can even be custom-decorated to match your event's theme. This portable bathroom has two separate sides to accommodate men and women. Both the men’s and the women’s sides feature two stainless sinks surrounded by beautiful Corian counters. The men’s side features two private stalls and four waterless urinals, while the women’s side features four private stalls. Six-panel doors, wood-grain floors throughout and crown molding create a true home-like feel to the Elegance Series portable bathroom. There are 200 gallons of fresh water available on-board, and the waste tank holds 1,150 gallons. This portable luxury restroom requires four 20 amp 110v electrical outlets. Superior Portables can supply a generator if electricity is not available. The laminated floors allow for easy clean up. The trailer comes with a deep cell battery backup in case of a power outage. The Elegance Series restroom trailer is perfect for a large upscale outdoor wedding, fundraiser or graduation party in Ohio, West Virginia, Pennsylvania, Kentucky, Indiana or Michigan. Contact us for more information about our luxury portable bathroom trailers or chat with a member of our team using our Live Chat platform. 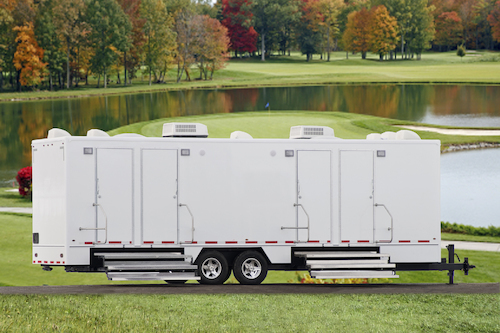 Superior Portable services recently had the opportunity to provide deluxe restroom trailers for an upscale fundraiser.